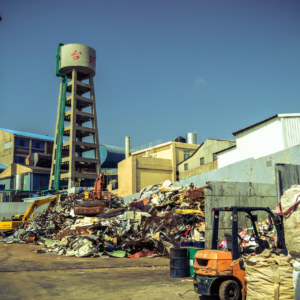 Bland, boring industry outside of Kaohsiung. I didn’t plan my tenth day on the road very well. I woke up in Sānmín 三民 on the north side of Kaohsiung City 高雄市, got ready, and went downstairs to find breakfast. I had only a vague idea of where I might go and what I might do. 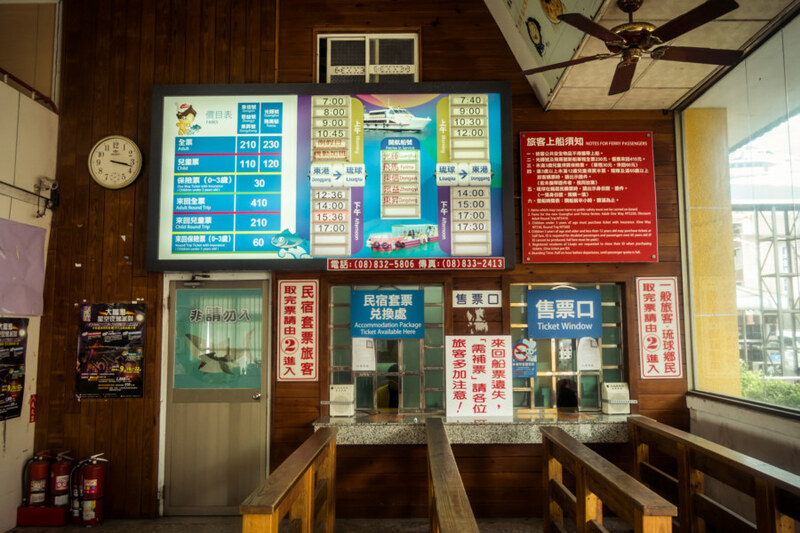 The plan was simply to see a little more of what Kaohsiung 高雄 had to offer—and maybe make a small detour to Liúqiú 琉球, a small coral island off the coast of neighbouring Pingtung 屏東, but I hadn’t really thought it through. 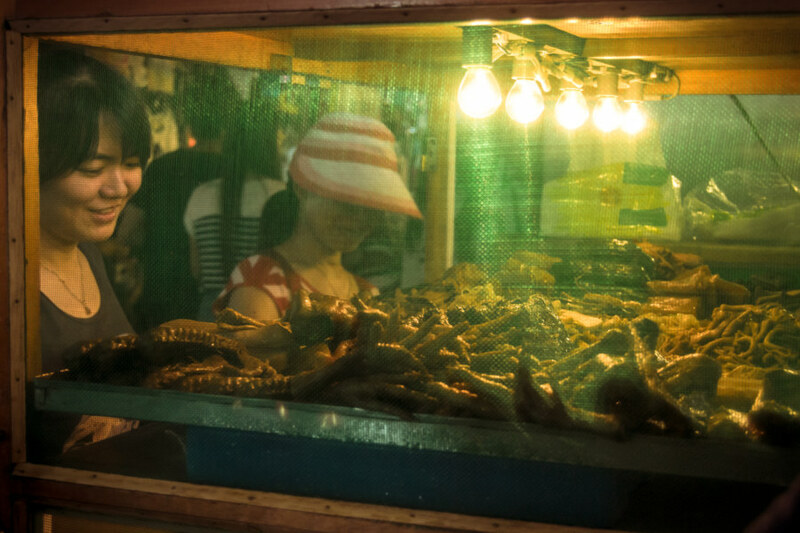 Kaohsiung by day was scorching hot and ultimately not that interesting. 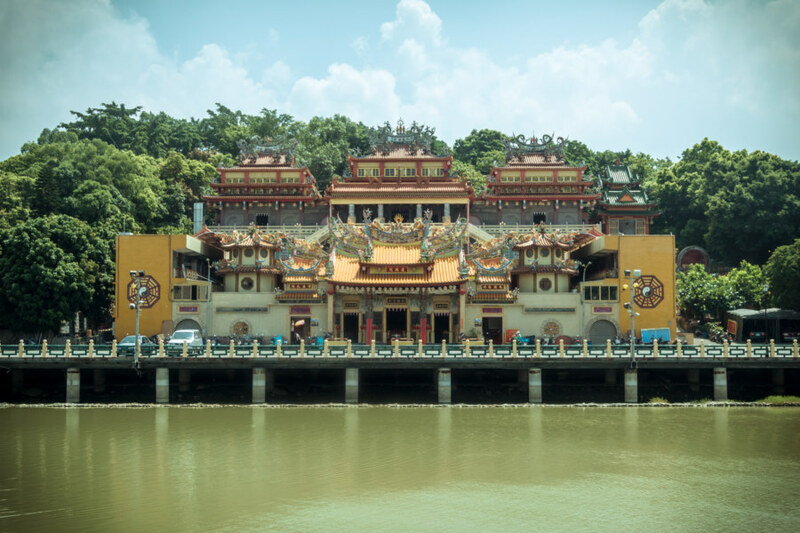 I spun by a lake with a temple on it not far from where I was staying but had to keep moving—the sun was simply unbearable. I headed south toward downtown Kaohsiung, stopping for a coffee in a vain attempt to kickstart my system. My day had barely begun and I was already bathed in sweat. Entire rivers were running off my arm, forming small pools on the floor of the cafe. It was disgusting—but I was getting used to this sort of thing by then. 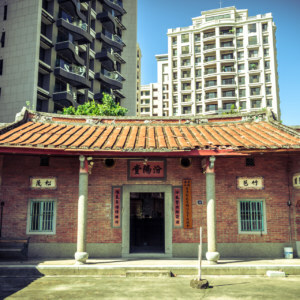 A temple in Sanmin district, Kaohsiung. Prior to leaving the cafe I had a look at Google Maps on my phone. I browsed around the area, idly tapping various landmarks, but didn’t find anything that piqued my curiosity. Since I hadn’t done any real research into Kaohsiung city I opted to strike out for Dōnggǎng 東港, the port town across from Liúqiú 琉球. It didn’t look that far away. Later on I found out I was misled by the lack of scale bars on Google Maps—but by then it was too late. I was committed. 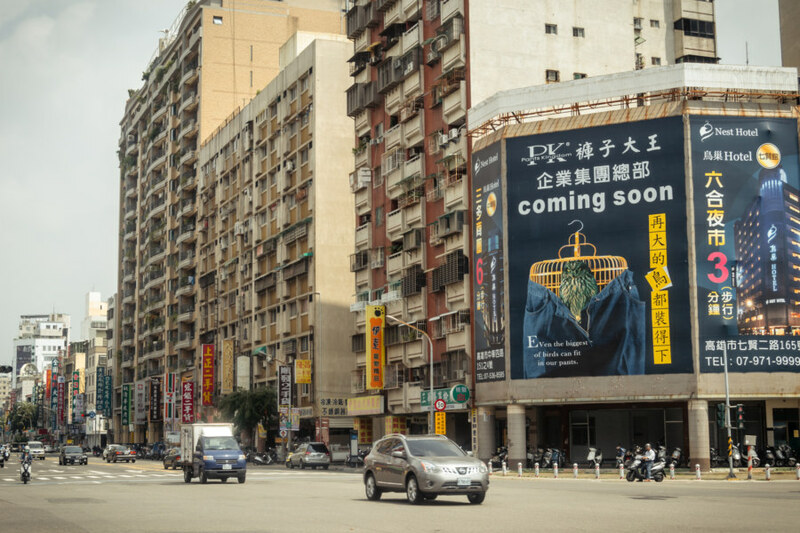 A typical downtown Kaohsiung street scene. The big billboard on the right is using sexual innuendo to sell pants. 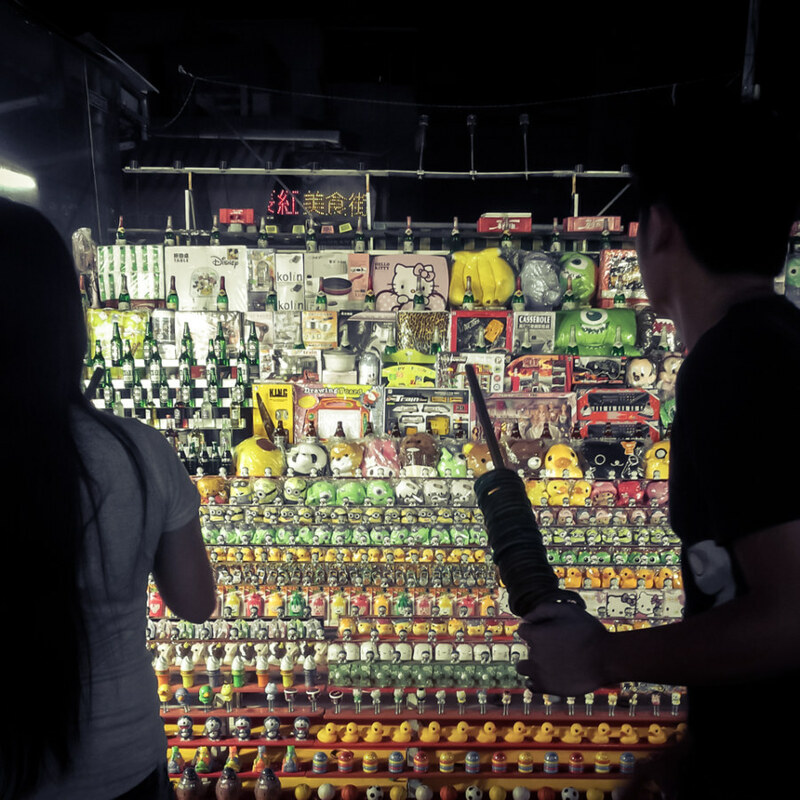 As I made my way through downtown Kaohsiung I didn’t regret my decision. At a glance it didn’t appeal to me very much. All the streets were too broad and neatly organized. Nothing really stood out apart from a lurid billboard making a sly reference to the male anatomy. I did not otherwise raise my camera to the sky to capture anything of my experience until I was far outside of the city. I ended up taking highway 17 most of the way to Donggang. 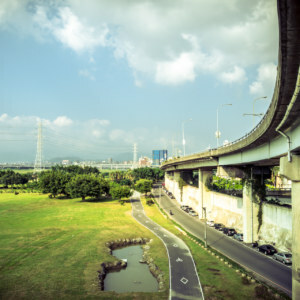 This highway passes by Kaohsiung international airport and then turns south into a bland industrial wasteland. 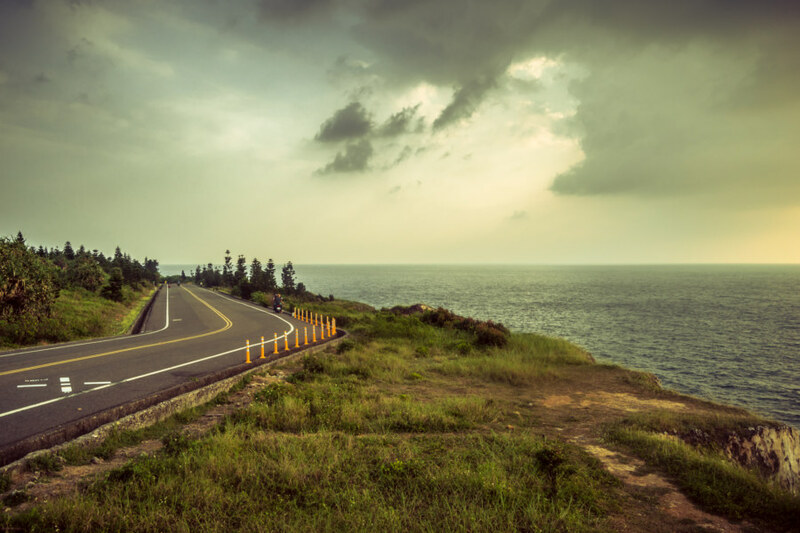 Some effort has been made to obscure the ugliness of the landscape by lining the highway with trees until it nears the coast. 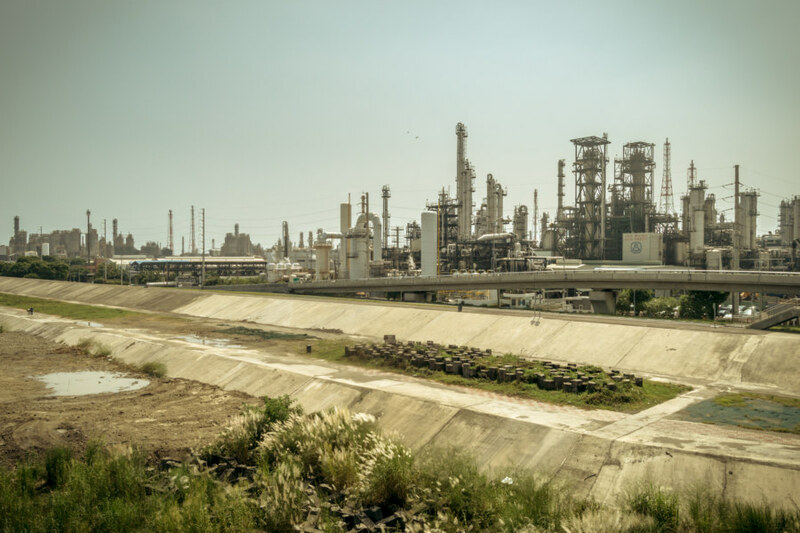 At that point the cover is stripped away and its nothing but dry and dusty roads lined with industry until reaching Donggang. 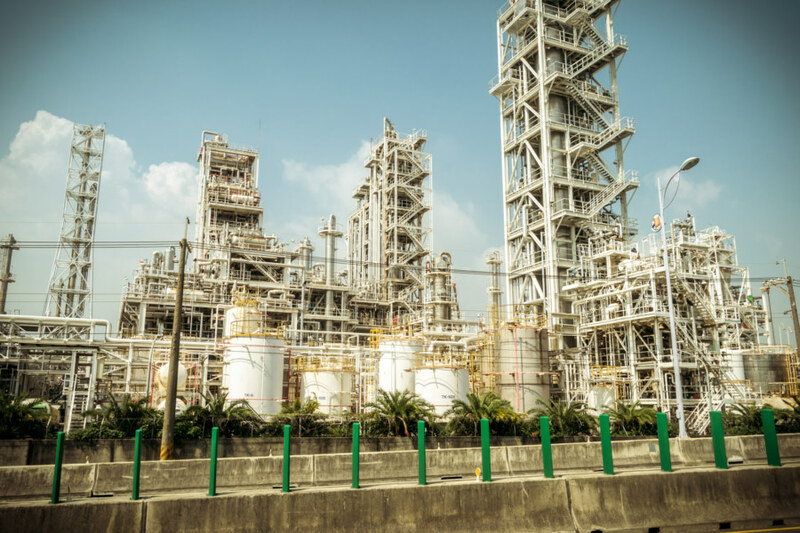 More industry outside of Kaohsiung, this time on the county line. 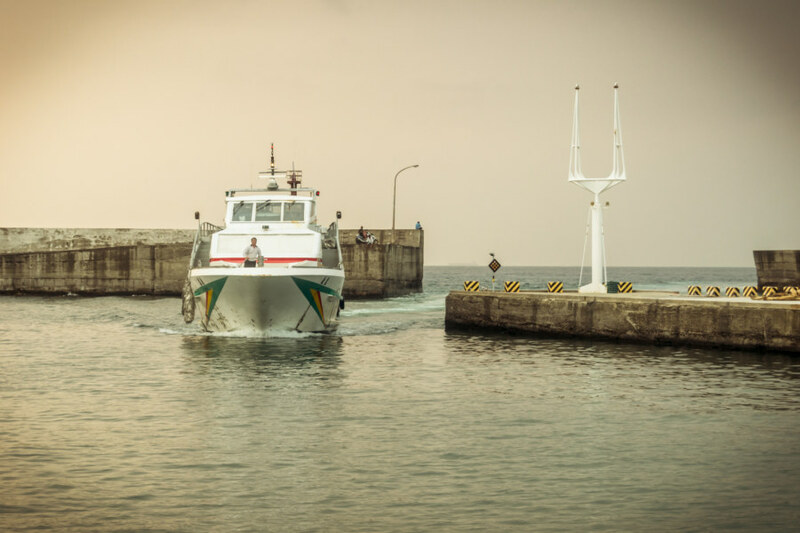 When I crossed the bridge into Donggang my first goal was to find the ferry terminal. I had the ferry schedule bookmarked but wasn’t entirely sure where to find the terminal itself. It turns out it wasn’t difficult to find—but buying a ticket was another matter. Without speaking Chinese I often find myself in absurd situations involving wild gesticulations, a lot of smiling, and plenty of patience. This was one of those occasions but—as usual—it went off without a hitch, and soon I had a ticket in hand. I left the terminal with an understanding that there would be a ferry sailing in about an hour. At the ferry terminal in Donggang. You can see the fares and schedule if you zoom in. I went off in search of lunch and to see more of the town. What I could see of it was not particularly interesting—it looked like any other small town on the plains. 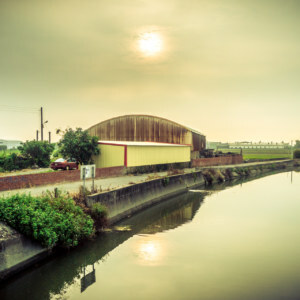 I did, however, notice a preponderance of Thai and Vietnamese businesses, readily explained by the fact that Donggang is one of Taiwan’s major fishing ports. 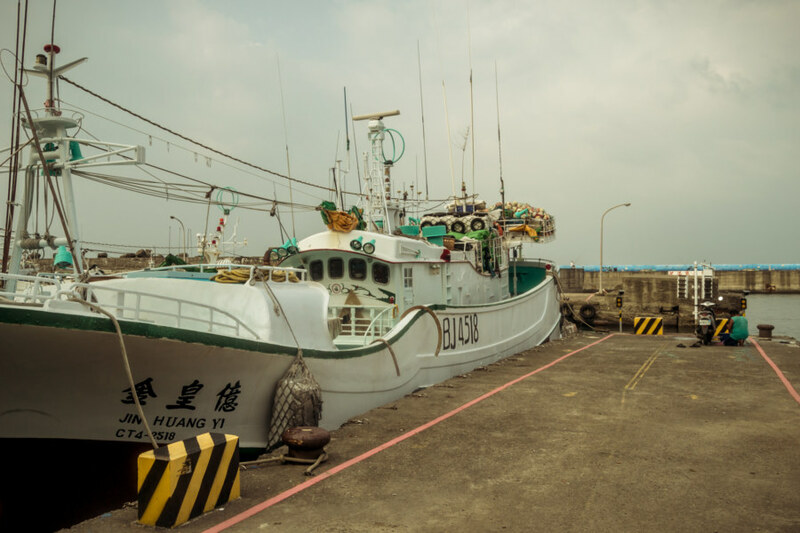 Most of the foreigners in Taiwan are in fact southeast Asian labourers and fishermen, though you wouldn’t know it if you read the newspapers here1. 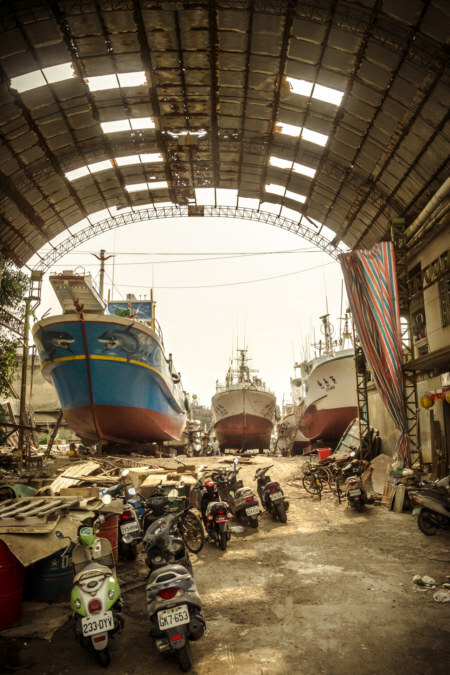 A shipyard on the outskirts of Donggang. 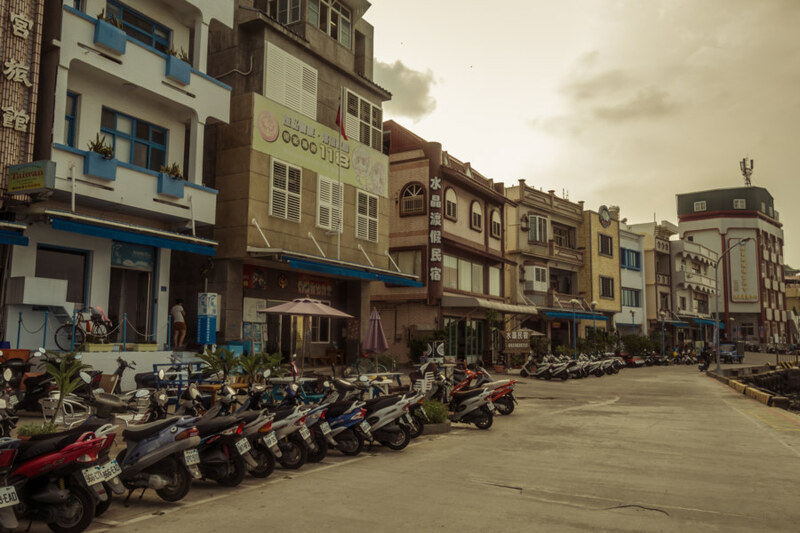 A Vietnamese restaurant in Donggang. 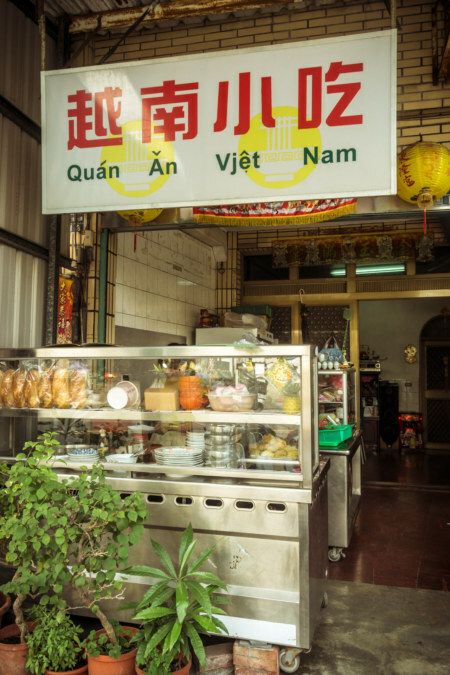 There probably isn’t a single Vietnamese restaurant anywhere in Taiwan without a sign out front emblazoned with the words “quán ăn việt nam” (literally “Vietnamese restaurant”). As soon as I saw one such sign I decided to stop and try their bánh mì, a sandwich on something resembling a French baguette, figuring that it would probably be fairly authentic. The proprietress was a friendly old lady, visibly surprised to see me pull up and make an order in broken Chinese. A gaggle of oddly-dressed Vietnamese women of indeterminate age sat at a small table nearby. They stared at me curiously and I stared right back, mystified by their distinctly unfamiliar mode of dress. Who wears leopard print and gold sequin cocktail dresses in the middle of the tropical afternoon heat? Middle-aged Vietnamese housewives, I suppose. We exchanged friendly smiles, obviously amused by the sight of each other. Actually, I’m quite sure one of those ladies was checking me out. 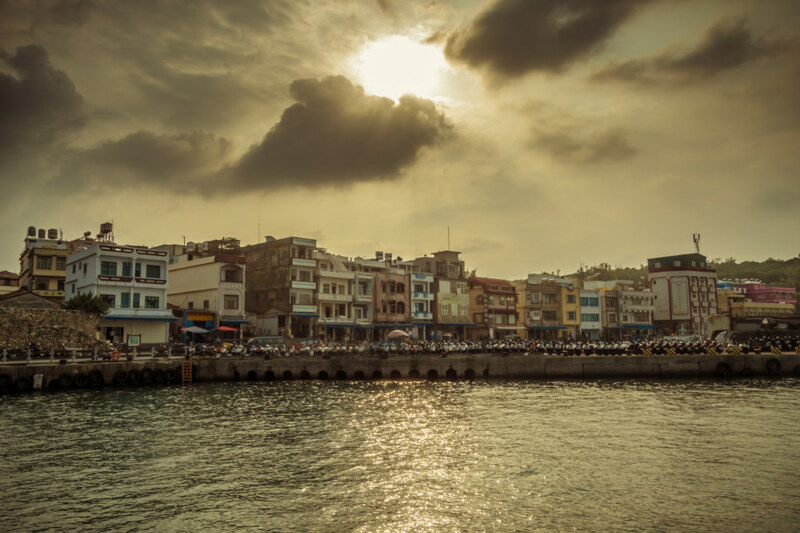 With a Vietnamese sandwich in my bag I sauntered back in the direction of the ferry terminal, impulsively stopping to order a coffee from a small shop open to the street. I was met by the alien glare of a young Taiwanese woman wearing a set of vivid blue contacts, the sort that are designed far more for effect than to blend in. Having blue eyes myself I made a cheeky comment, complimenting her on her choice of colour. With a bashful smile she passed me a small cup of coffee in a plastic bag with a straw. Nothing like drinking black coffee out of a straw on a hot summer day, right? My ride on the ferry to Liuqiu. 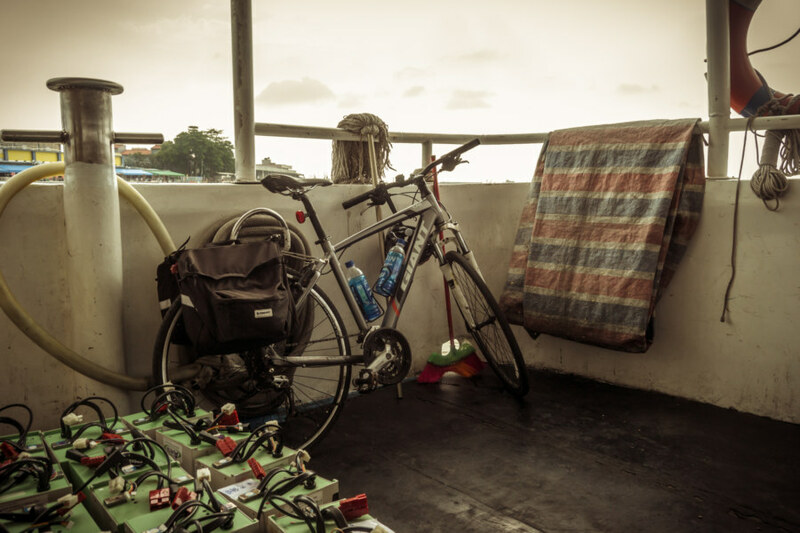 Boarding the ferry was somewhat confusing as I had to pay a surcharge for my bicycle—a fact I only found out when I went to board the boat, ticket in hand. 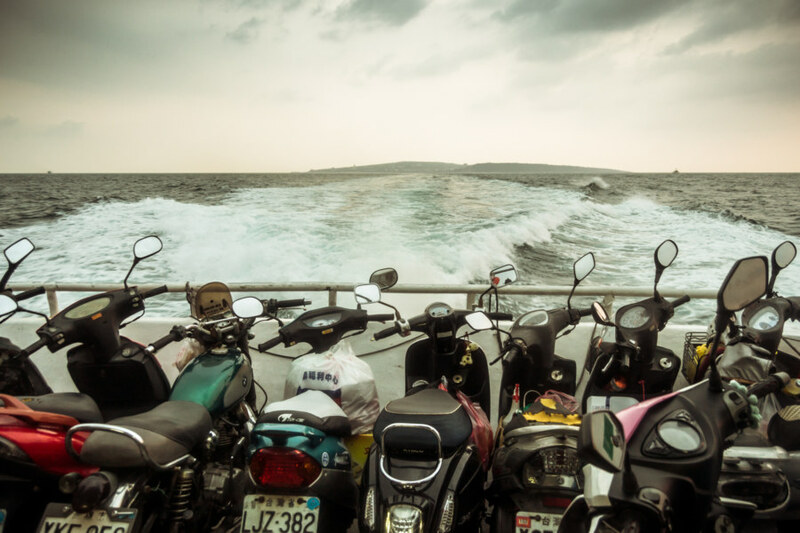 After making a quick trip back to the counter I was on the boat with my bike stashed next to a bunch of scooters on the aft deck. 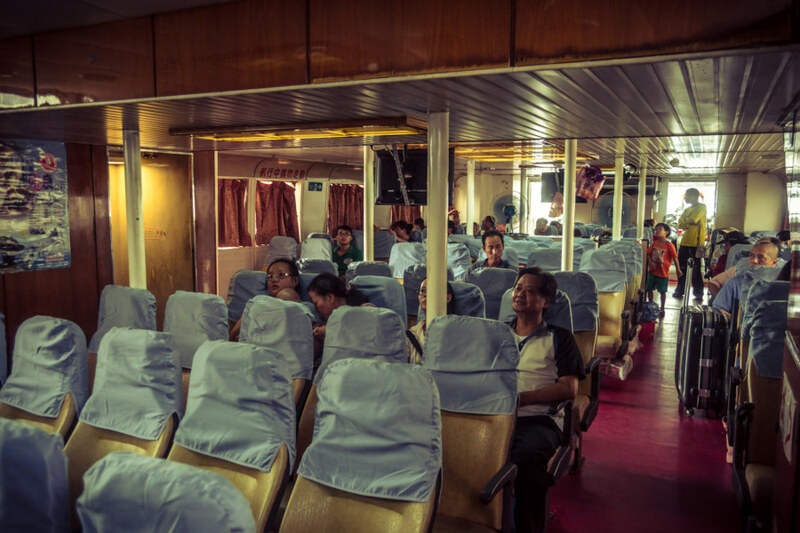 Inside the ferry, which appeared to have the capacity for maybe 100 people, I wandered around, curious to finally be on an oceangoing vessel in Taiwan. On the ferry ride to Liuqiu. The inside of the boat wasn’t hugely interesting so I spent most of the half hour trip on deck. 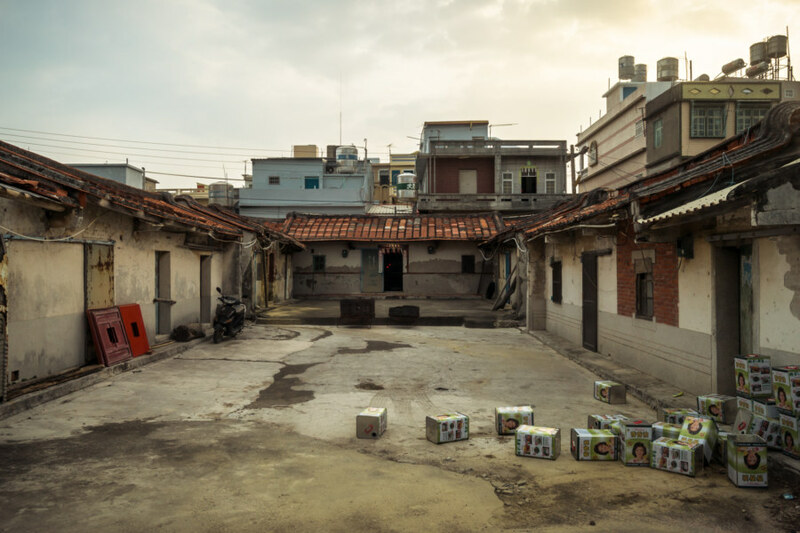 There wasn’t too much to see after leaving Donggang behind—but one of the crew struck up a conversation with me in English to pass the time. I suppose he might have been bored as well, and there I was—the lone foreigner on board. At any rate, he told me he had sailed on all kinds of boats throughout his career, beginning in the navy before moving on to commercial fishing. On the approach to Liuqiu island. You can see how late in the day it was. Soon the intersection of his English language proficiency and my understanding of the ways of the sea was exhausted and we leaned up against the railing to look out on the ocean. Liuqiu island began to grow on the horizon as we made our approach. Coming into port. I had an engaging conversation with the man on the right. It was late in the day when we sailed into harbour. In fact, this was the penultimate crossing; the very next ferry would be the last one to return to the mainland. Since I hadn’t packed for an overnight stay I had to return—which meant that I had slightly more than an hour to explore Liuqiu, and no more. I would say that I hadn’t planned this well—but I hadn’t planned anything at all. I meant for my round-the-island bicycle trip to be fairly spontaneous. I was going with the flow and the flow had limited me to just a small taste of Taiwan’s only coral island. So be it. 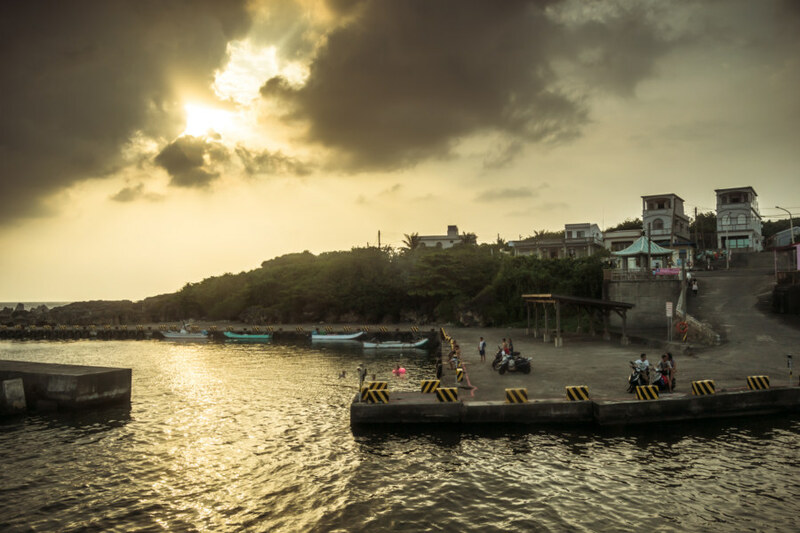 Truth is, I went to Liuqiu island, also known as Lamay Island, without any real idea of what I might find there. A friend had recommended it to me and I had probably seen a couple of English language blog entries about it but I really didn’t know much. There were a bunch of famous rocks, some temples, and—well, you get the idea. There were things to see and I was there to see them, whatever they were. 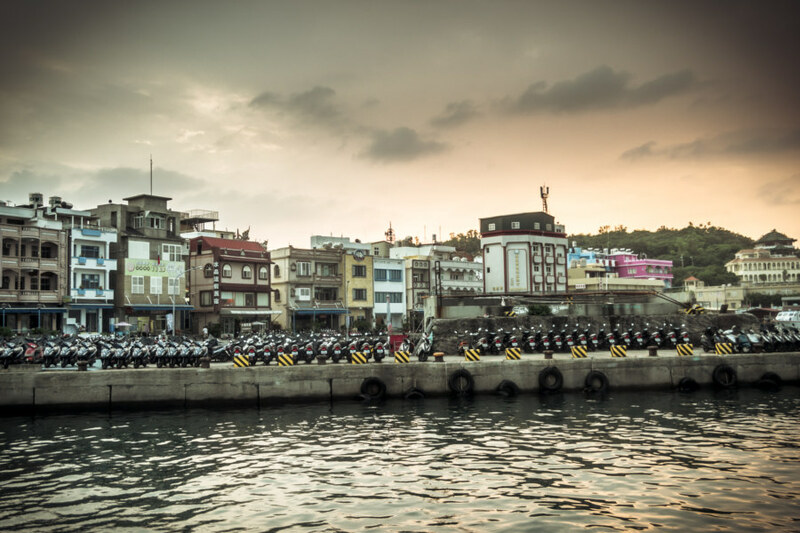 Coming off the ferry in Liuqiu. While coming into port I started to wonder whether I could circumnavigate the island in the short amount of time I had available. After referring to Google Maps and making some rough calculations I decided that it would be doable—but I would have to hustle. I wasted almost no time disembarking from the ferry and rolling up and out of the harbour to the main tourist beat. 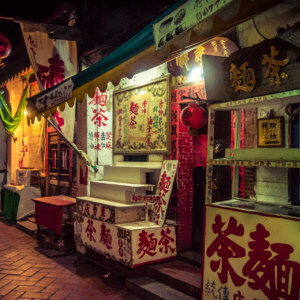 On some level I hadn’t expected to see many of the same shops and conveniences I was familiar with from other places in Taiwan but they were all there—convenience stores, tea shops, banks, pharmacies, and so on. 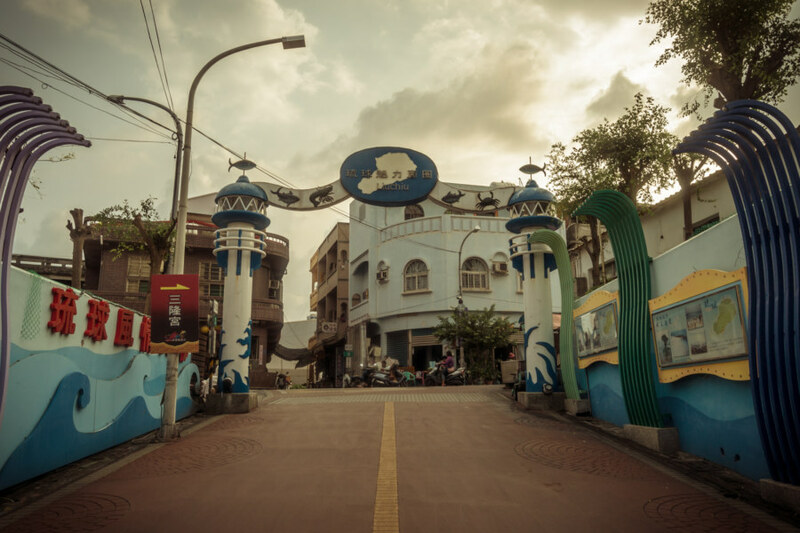 The entrance to Liuqiu town. The main tourist beat. 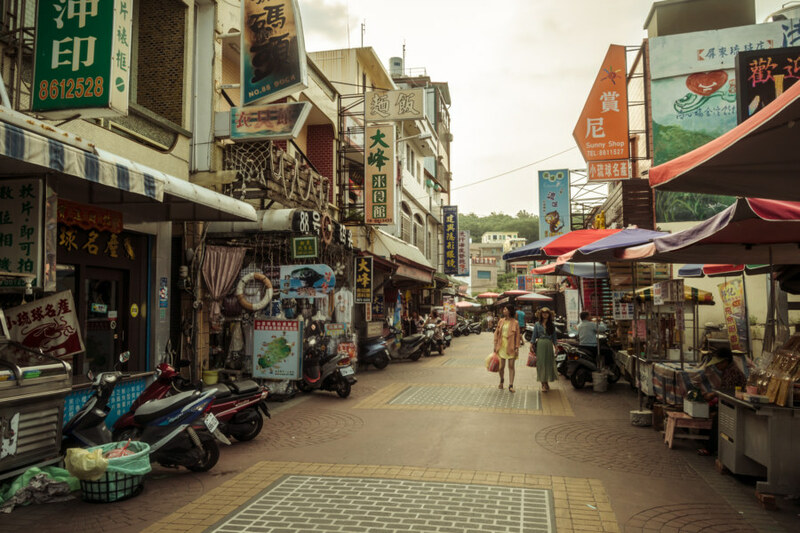 For such a small island it somehow manages to have just about everything you’d find in any other town in Taiwan. 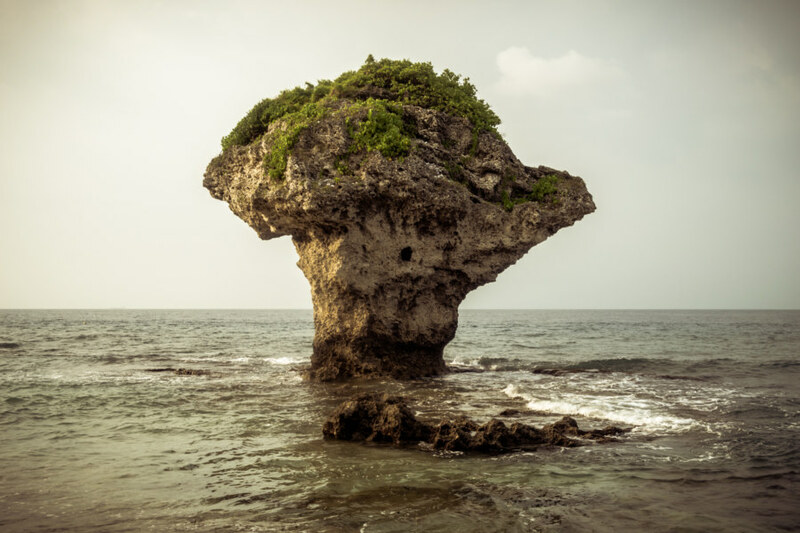 Moving right along, I went on a small detour to check out famous Vase Rock 花瓶石 on the northeastern shore of Liuqiu. Down on the beach I found a bunch of Taiwanese tourists trying to capture one of those generic photos where everyone jumps at the same time. Most people probably find this sort of thing annoying, as it invariably requires several attempts to get a good picture, especially when using a smartphone. I didn’t really mind, however. As a student of human nature I am curious about the group dynamic. I always wonder, at what point will their resolve falter? Who will be the first to complain? And when will genuine smiles decay into inauthentic grins? After six or seven attempts they were done and I had my chance to capture the obligatory tourist photo. I turned around, climbed the hill, and made my way north to the ring road that girdles the island. Wasting no more time, I kept up the pace as I slid down the inclines and pushed myself back up the rolling coastal highway. 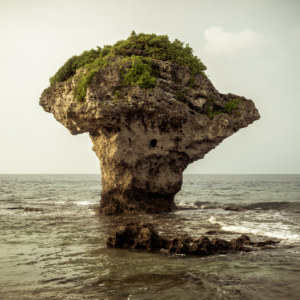 Along the way I passed several attractions with intriguing names that I would have loved to explore—the intriguingly named Black Dwarf Cave 烏鬼洞風景區 for instance—but I simply didn’t have the luxury of time. 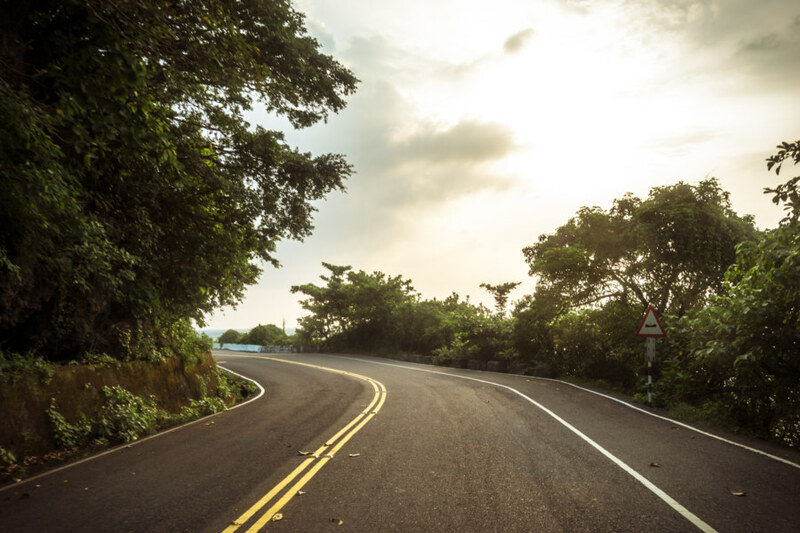 And, anyhow, the sweeping curves of the highway girdling Liuqiu island were better enjoyed without stopping very much. 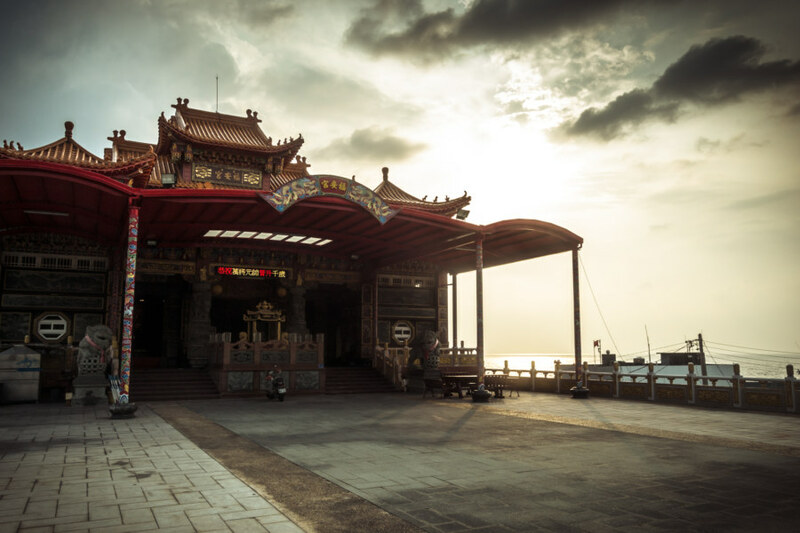 A seaside temple in Liuqiu. 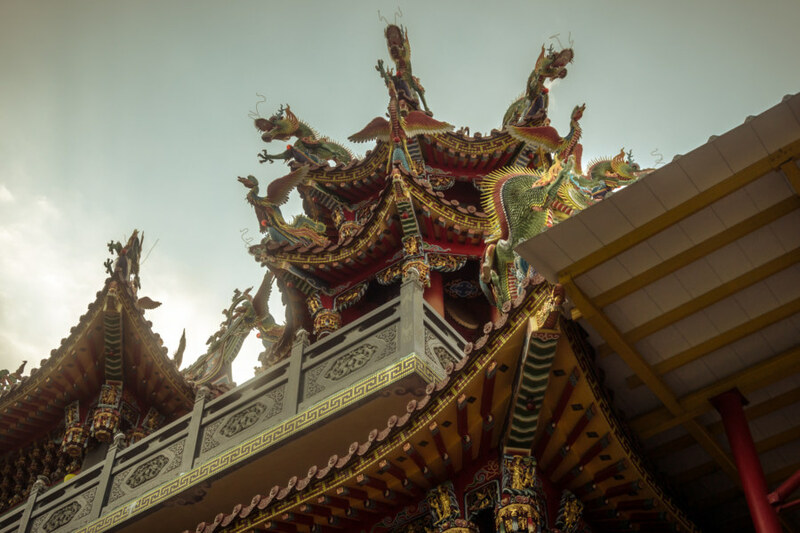 Dragons on a Liuqiu temple near the sea. 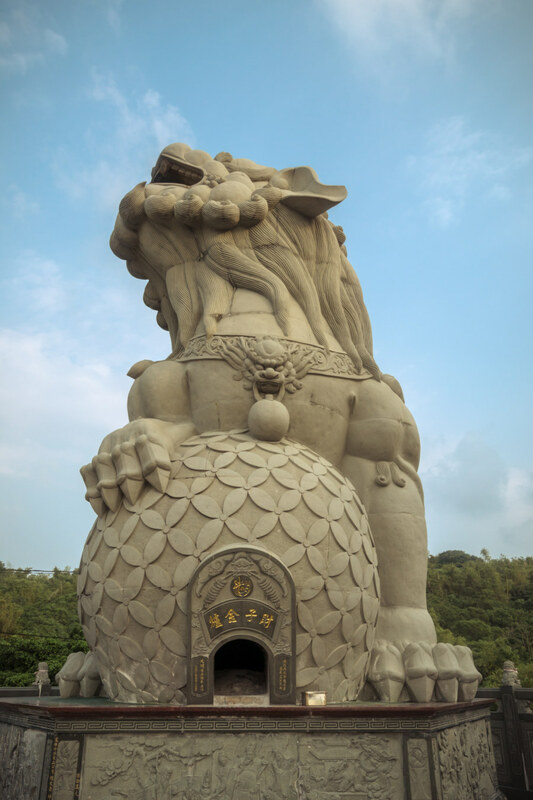 A stone lion at one of the seaside temples. 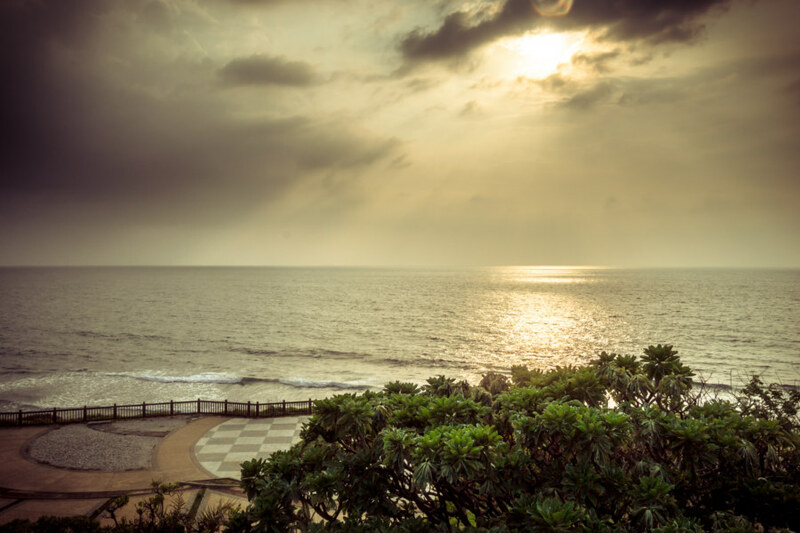 An isolated grave overlooking the sea. Looking out on the South China Sea from Liuqiu island. Around the back of the island, out where it faces the open waters of the South China Sea, I finally began to feel remote from humanity once more. There were a few places where there was nothing more than a viewing platform overlooking the cliffside leading down to a rocky shoreline. I also noticed a military installation of some kind perched on a hilltop far from any other structure. There was a serenity to this place that I would have loved to have indulged in—but I had a ferry to catch. Riding the ring road on Liuqiu. Around another bend to the far side of Liuqiu. The far side of Liuqiu island. 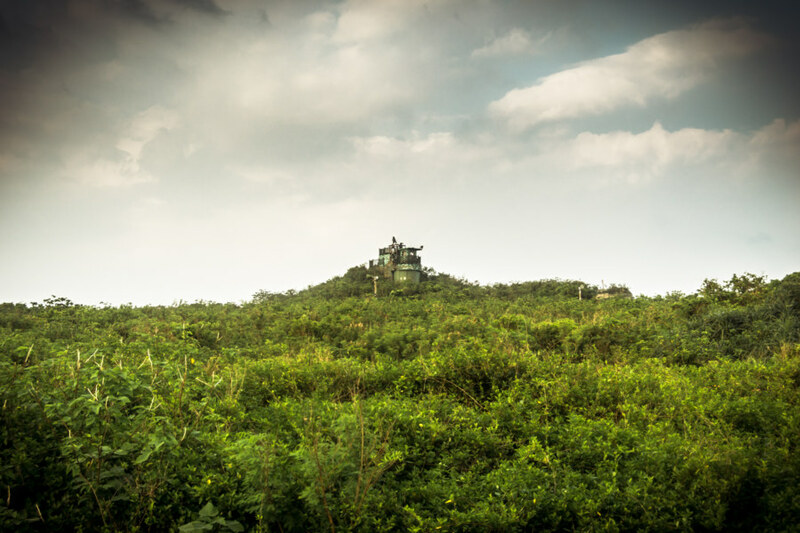 A military installation in the most remote part of Liuqiu. Returning from the far side of the island I immediately passed by Haizikou 海子口, a small harbour with some temples overlooking it. 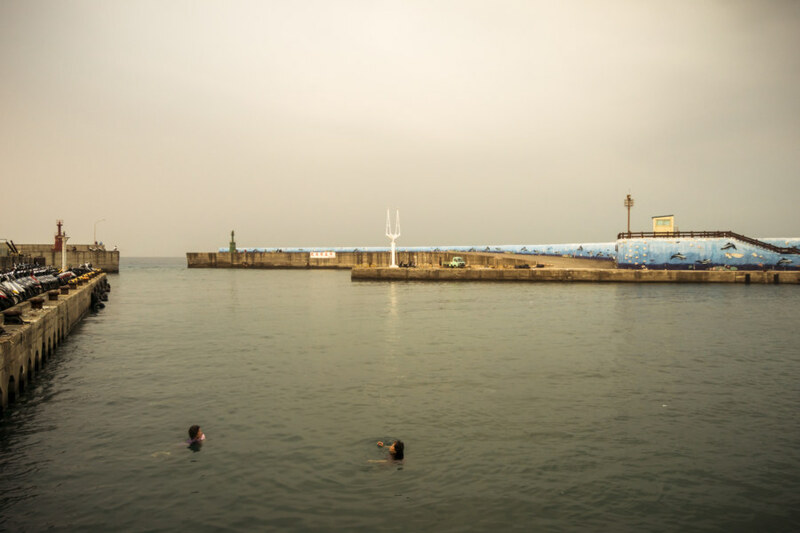 While stopping to take a photo one of the locals noticed me and began to shout, “Hello!” This led to a great uproar as pretty much everyone down by the harbour began shouting at the white-skinned apparition across the water. I smiled and waved and carried on, amused. A harbour at the far end of Liuqiu island. 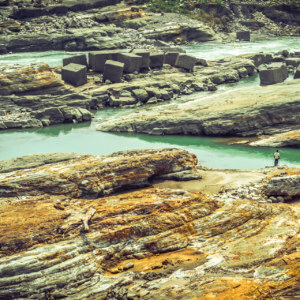 The next notable sight was Indian Rock 紅蕃石, which—at the time—I had thought referred to Taiwanese indigenous people. Having done a little more research since then I now realize that the name refers to indigenous people of the Americas (in a somewhat less delicate fashion). The reason for the name should be obvious; it has the look of a human head with hair swept back. 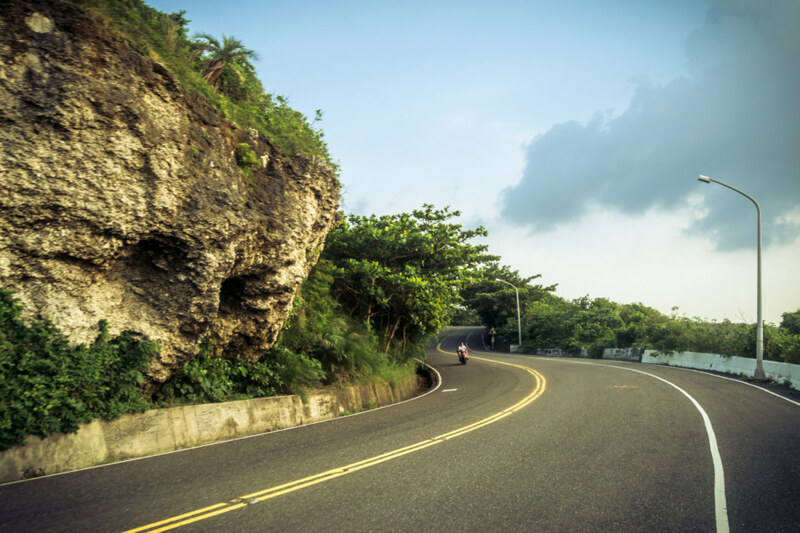 An amazingly scenic highway ride. 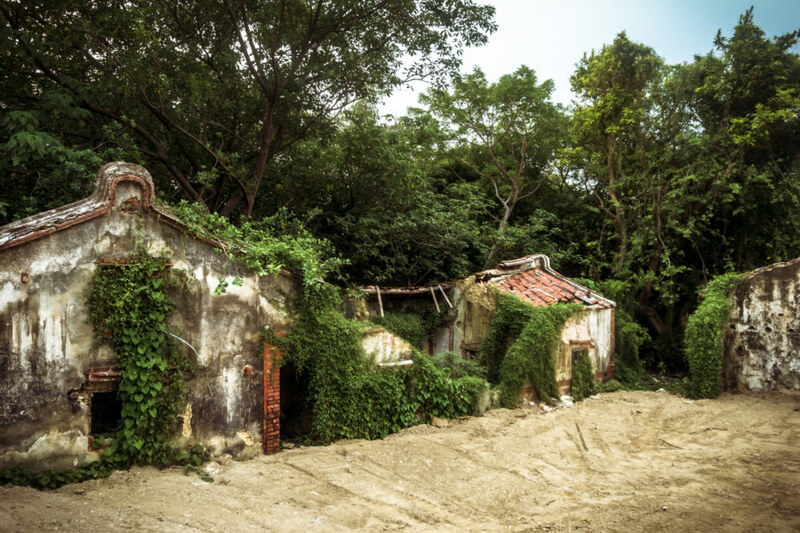 Overgrown traditional homes on Liuqiu island. 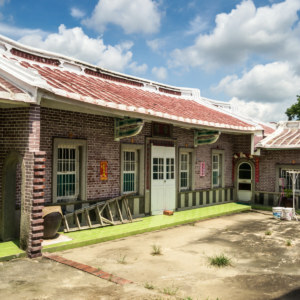 A traditional courtyard home on Liuqiu island. Not long after that I was back in the more settled part of the island not far from the ferry dock. 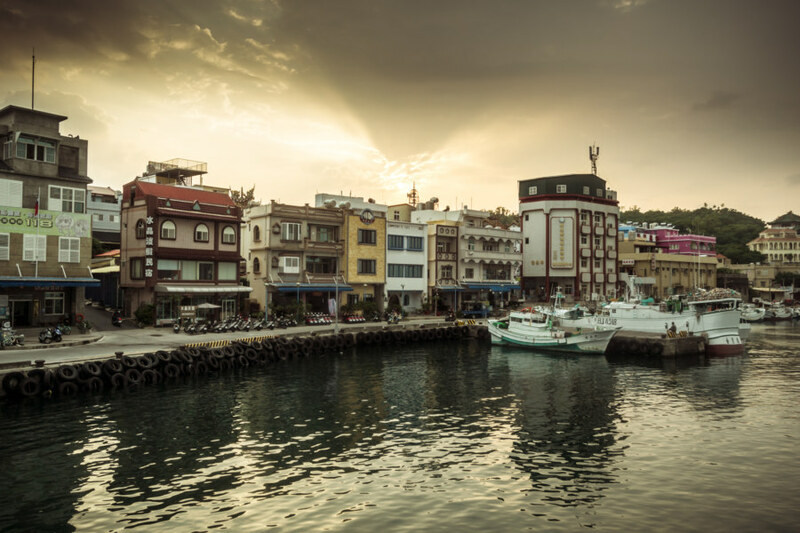 I had made good time riding at a breakneck pace around the island so I roamed around the area near the harbour, snapping photos and trying out one of the local snacks, a kind of sweet potato crisp, before boarding the ferry not long thereafter. 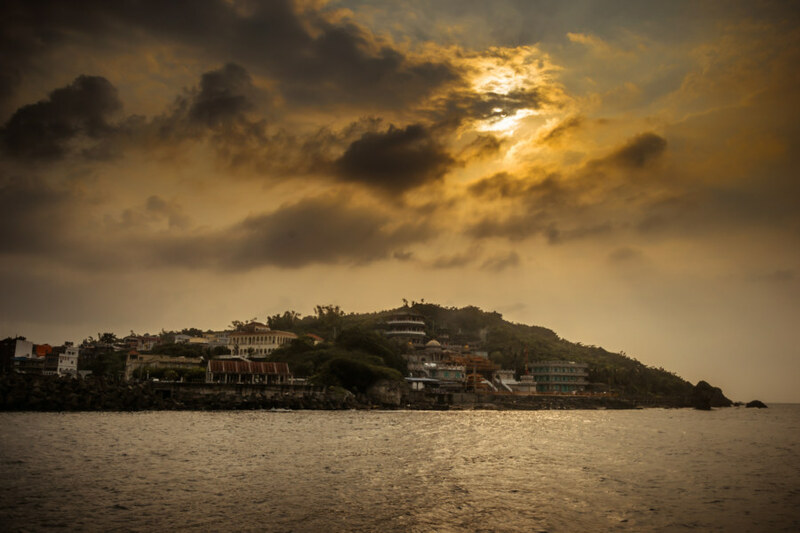 It was a beautiful departure with the warm glow of sunset lighting the sky as the island receded from view. Last ferry out of here. Heading out to sea; have a look at all those scooters on the dock! 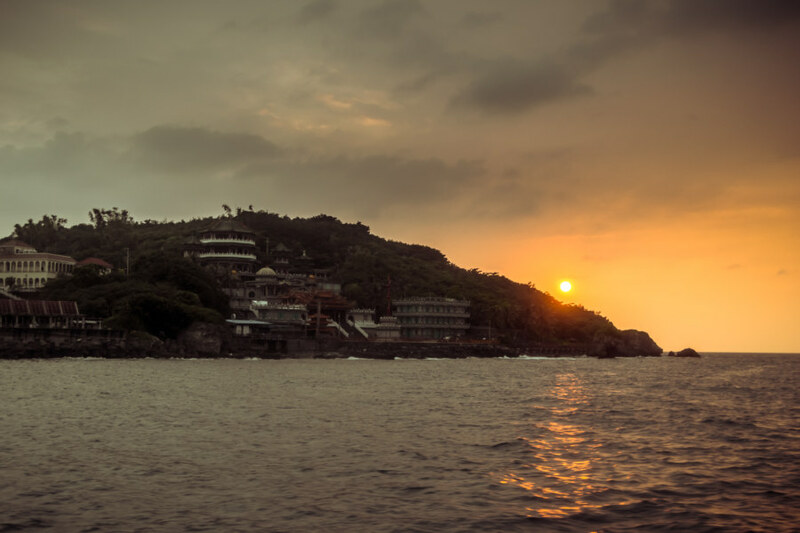 Sunset over the limb of Liuqiu island. As the ferry plied its way back to Donggang the sky began to taken on a grim, forlorn pallor, and soon it began to rain lightly. By the time I exited the ferry terminal with my bike, ready to ride, it was raining in earnest, and darkness had settled across the land. 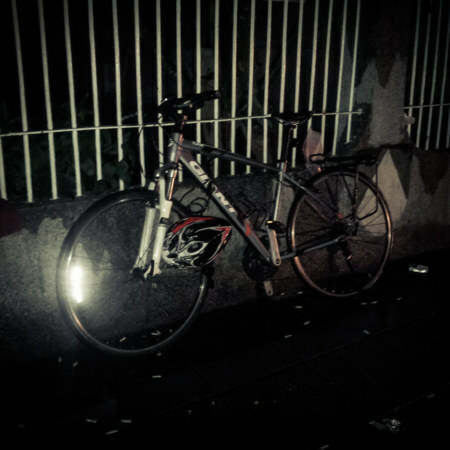 I wasn’t completely averse to riding in the rain but I had left my stuff in Kaohsiung—which meant a soggy three hour ride back in the dark before repeating the same ride the next day. I stopped under an awning and broke out my phone to see what my options were. 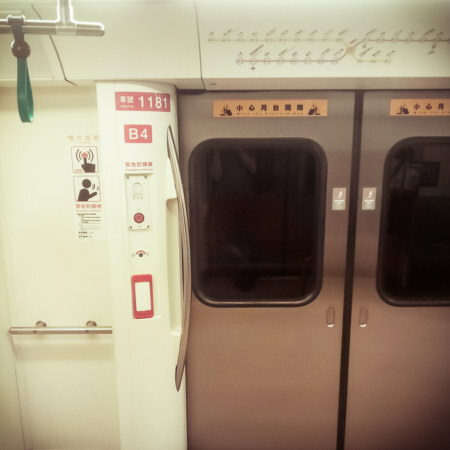 The moment I saw there was a direct bus to the Kaohsiung MRT my mind was made up. I rushed over to the bus stop, quickly locked up my bike, and was just in time to catch a lift back to the big city. The bus ride back to Kaohsiung gave me some time to think. I was content with how everything had worked out but something was eating at me. 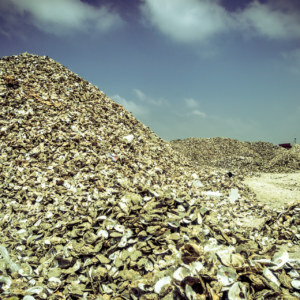 I felt good about my whirlwind tour of Liuqiu island but it was dangerously close to the sort of tourism I abhor. You know the kind: rush from place to place, take the photo, share it on social media so all your friends know you’ve been there, and move along before having the chance to actually learn much of anything. I couldn’t shake the feeling that I could have had a much richer experience had I done a little more planning than none at all. Going with the flow is fine—but sometimes it helps to channel that flow somewhat. It certainly would have helped on this particular day—and so I vowed to be more mindful of time for the remainder of my trip. 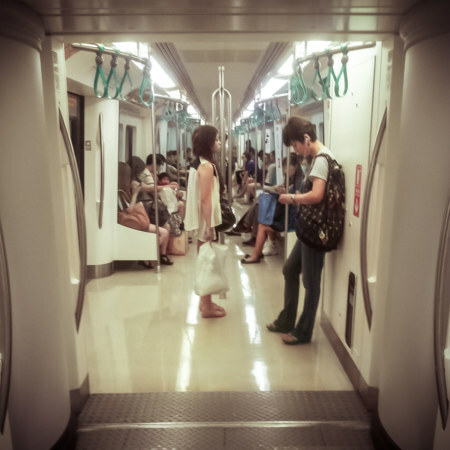 Riding the Kaohsiung MRT after a day on the road was a bit surreal. 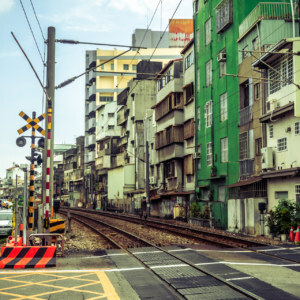 Taipei has a world-class transit system but Kaohsiung’s is a little more, ah, utilitarian. The lighting is dim, almost to the point of gloominess, and things aren’t quite as clean, not that I particularly mind. The Taipei MRT feels futuristic whereas Kaohsiung MRT makes me think of the grimy, rundown transit system of my hometown, Toronto. Back in Sānmín 三民 I went back to Mabel’s place to drop my stuff off and wash up. Mabel, my host in Kaohsiung, was in a perky mood and suggested we go out to get some food. 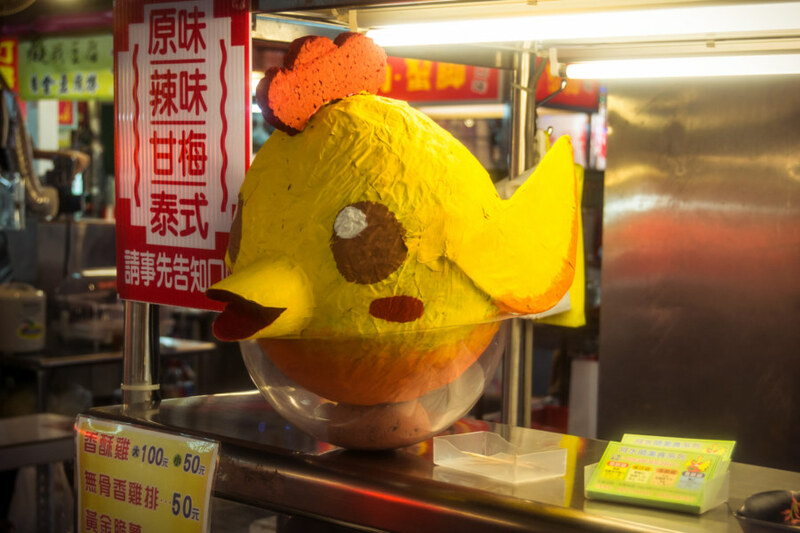 As chance would have it we ended up wandering out to Ruìfēng Night Market 瑞豐夜市, the same one we went to the previous night. I asked about Liùhé night market 六合夜市, a much more famous night market in Kaohsiung, but was told that it was just for tourists2. Cultural programming in the big city. At the night market we were joined by Mabel’s lanky gay friend, the one who had ventured up to Tainan to meet me two days previously. 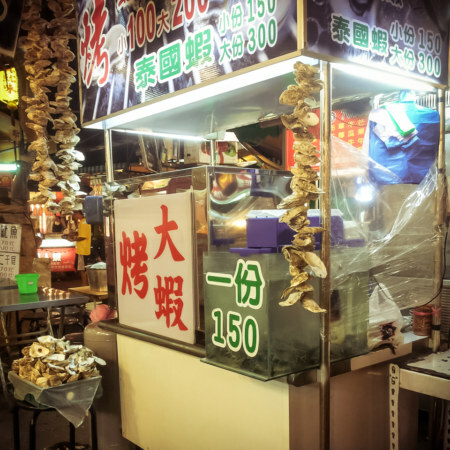 He had bought a few snacks for me to try in Tainan so I returned the favour, buying him something or another from one of the outer stalls. 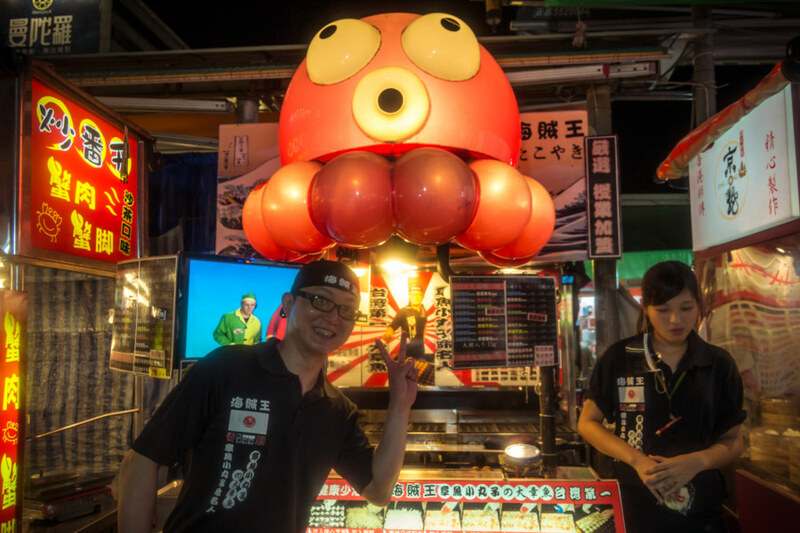 We wandered deeper into the night market, looking out for anything strange and unusual, and were all quite shocked when we saw a morose white man vending cookies at the far end of one row. 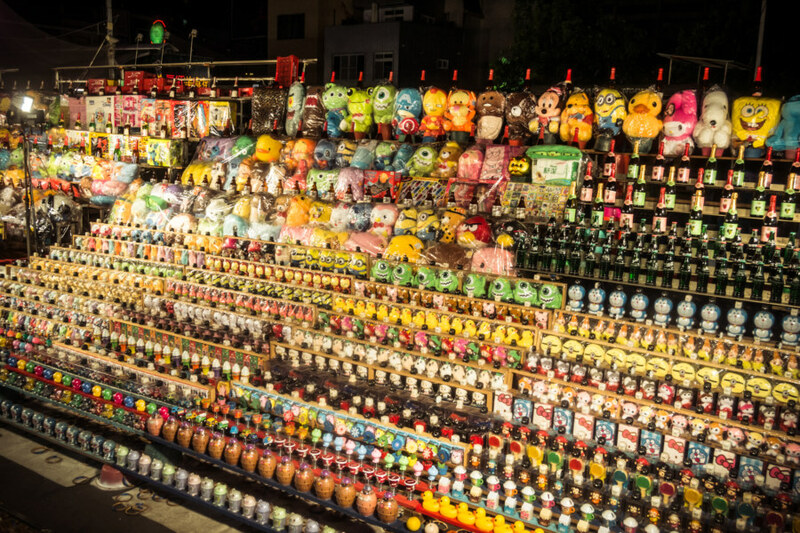 Fairground games at a night market in Kaohsiung. 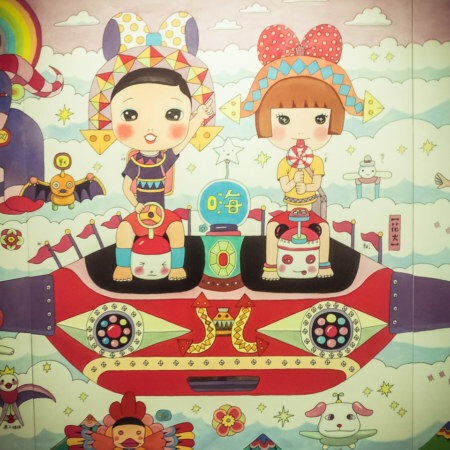 At Mabel’s urging I ended up playing one of the fairground games for the first—and so far, only—time in Taiwan. Mabel and I shot balloons with air guns—but the host of the game, smirking, handed Mabel a gun with a laser pointer attached to it. 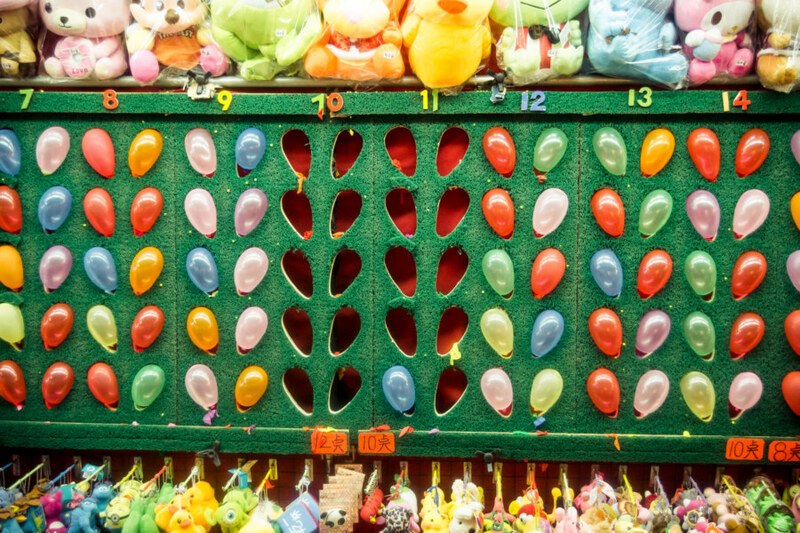 She shot all ten balloons without much effort and I only missed one—not bad given my limited depth perception. Back at Mabel’s place I took some time to read the news and sketch out a plan for the following day. Obviously I’d have to hop on a bus to head back to Donggang and continue my mission. 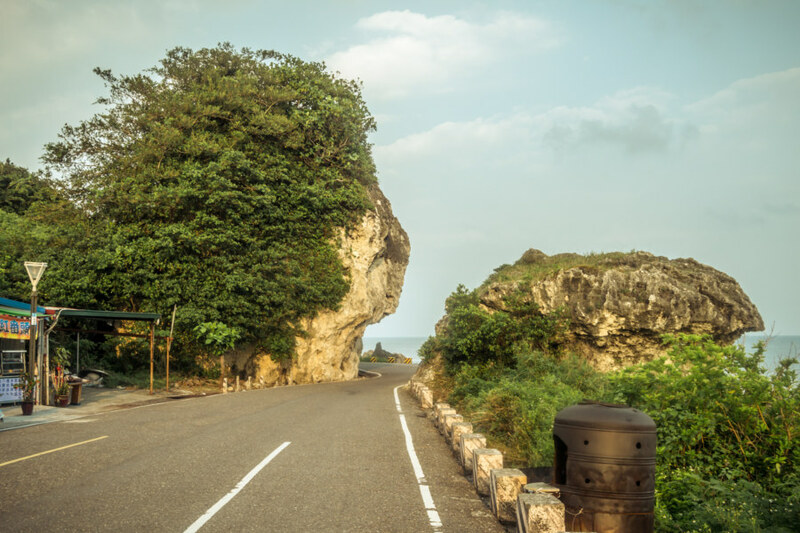 Beyond that I figured that it wouldn’t be much of a stretch to make it all the way to Kenting 墾丁, a famous resort town at the southern tip of the island, roughly 75 km down the road. Looking at the weather forecast I saw that tropical storm by the name of Usagi was gathering strength in the Pacific Ocean east of Manila. It was too early to say whether this would impact my travel plans but it certainly added some small amount of urgency to my itinerary. 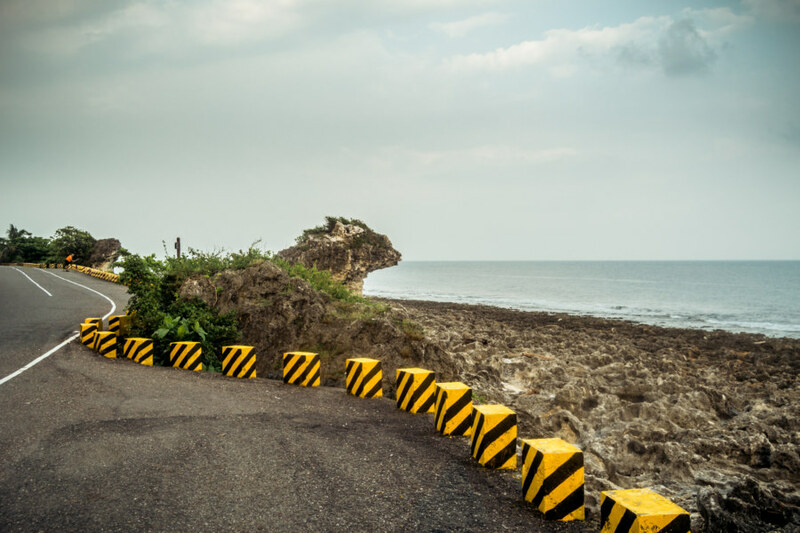 I didn’t want to be caught up in a typhoon in Kenting based on what I had heard about the place—namely that it was a bit of a seedy tourist trap. I mentioned all of this to Mabel and she told me I had better book a place in Kenting right away. My usual plan—just show up and look around—likely wouldn’t work as it was now a holiday, mid-autumn festival, and plenty of Taiwanese go to Kenting for the holidays. I had a brief look online and found she was right—most places were fully booked. I scrambled to find lodging for a decent price, eventually settling on a strange-looking place overtop a convenience store at the western end of the main drag. 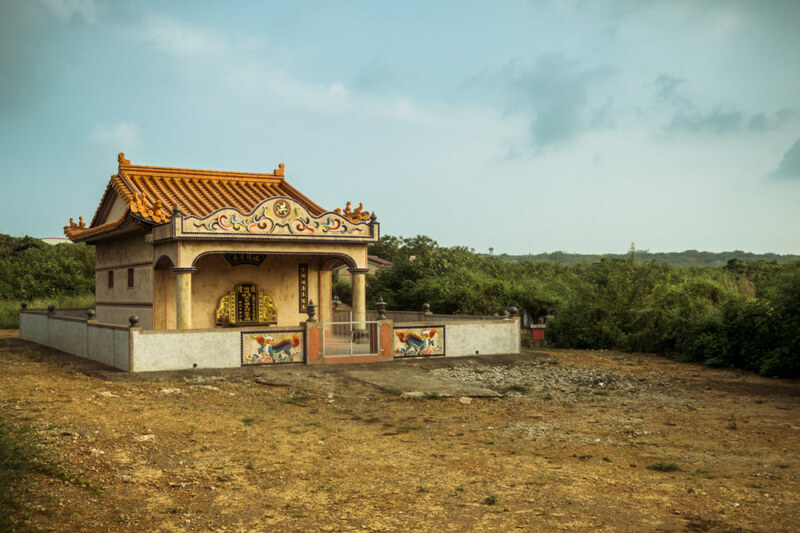 Mabel asked to stay with me as she was meeting friends in Kenting anyhow and I figured—again—sure, why not?” She’d been helpful, friendly, and respectful of the boundaries I had established (no funny business) so I didn’t give it much thought. With my plans for the next day all set I shut out the lights and went to sleep, clear skies in my mind. Segment: Kaohsiung City 高雄市 to Dōnggǎng 東港. Photos: 58 on Flickr, 19 on Instagram. I also had the same question about Taiwanese people drinking milk when I first moved here. I was born in Taiwan and our family immigrated to the States when I was fairly young. I drank milk readily as a kid in the States so my body has gotten used to it but my parents can’t drink milk from the States. 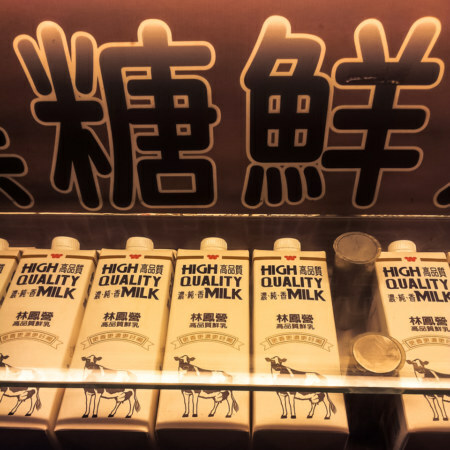 Strangely enough, milk from Taiwan doesn’t seem to do anything to them so I suspect that milk in Taiwan has different contents (maybe lactose free?) or it’s psychological. your blog is awesome! 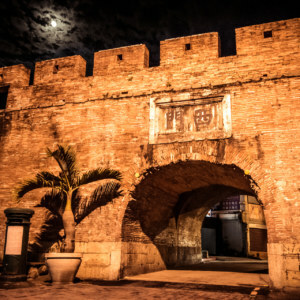 I am making a trip down to Kaohsiung and has plan to go to 小琉球 island from Dong Gang. 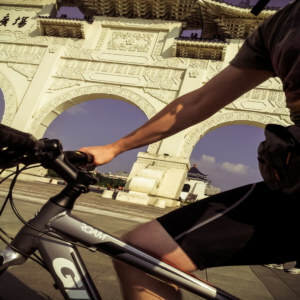 Are there any bicycle rentals similar to those in cijin island?